Arbuscular mycorrhizal (AM) fungi are important in soil microbial communities, and interactions between them and nutrients in soil may be significant in pastures. The diversity and abundance of communities of AM fungi are controlled by many factors, including agricultural practices, and changes in soil characteristics also influence microbial processes. 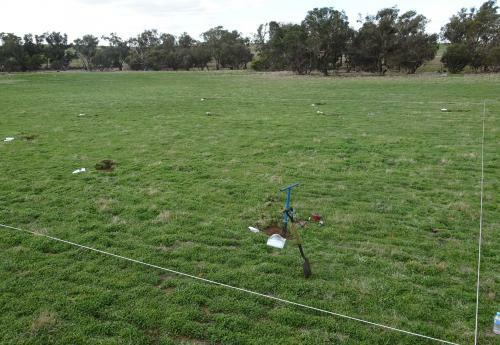 Assessment of the spatial distribution of nutrients and their relationships with the abundance of mycorrhizal fungi is being investigated within an 11ha site at the UWA Farm Ridgefield near Pingelly, WA. includes identification of how nitrogen and phosphorus fertilisers affect the vertical and horizon distribution of mycorrhizal fungi in dominant plant species in the pasture community. An evaluation of effects of fertilisers (varying in solubility) on growth of pasture plants in relation to microbial communities in soil is also being made. Finally, the impact of biochar, with and without amendment with fertilisers of different solubility, on nutrient leaching associated with pasture plants, will be quantified. 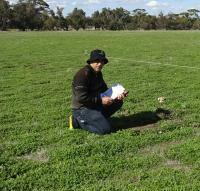 Mycorrhizal colonisation and microbial community dynamics is being monitored during the project timeframe in relation to the establishment of perennial pasture species following their introduction at Ridgefield Farm as an innovative agricultural practice for a landscapes that is traditionally managed with annual pasture species. This project is a field-based study, investigating the spatial distribution and function of AM fungi during the establishment of a mixed perennial / annual pasture. Perennial grass pastures in this region (south-western Australia) are uncommon and the farmers currently only use annual pastures for sheep production and crops rotation. This project is being conducted to evaluate the success of establishment of perennial pastures within a background of an annual pasture species in an area subject to encroaching salinity and poor soil structure. The survival of pasture species in correlation to soil characteristics, fertilisers, and soil amendments (biochars) in the mixtures will be assessed. These processes are important in managing pastures, and especially mixed perennial and annual pastures introduced into dryer regions. The project outcomes are also expected to hold relevance for other broad acre farmers in dry land grain belt by informing research and development strategies for maximising the efficiency of fertiliser use.